The Non-for-profit organization Venice Institute of Art & Music, promoter of Venice Music Master, was formed with the aim of creating an Academy that will provide high quality,short term study programs and master classes in Venice, Italy. Project Venice Music Master is open to young musicians, conservatory students, professionals, supporting musicians, teachers and soloists who wish to improve their musical skills and repertoire under the guidance of our distinguished tutors. 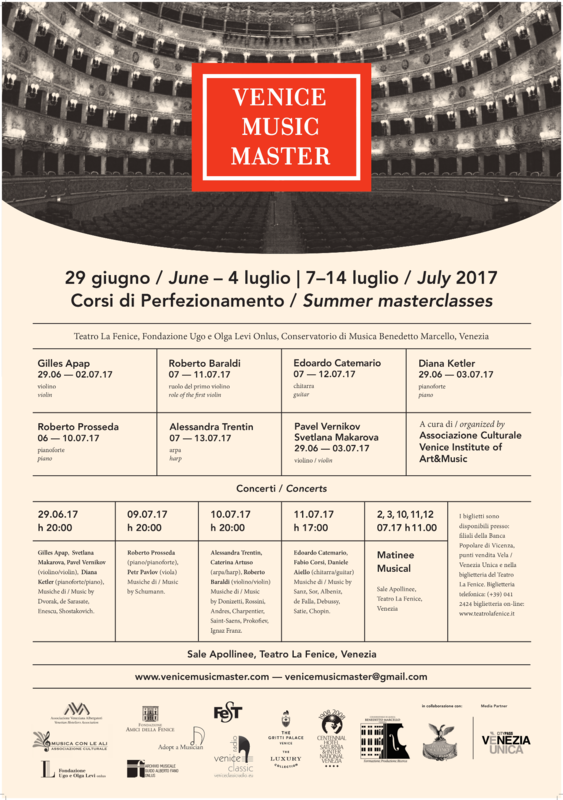 From June 29th to July 2, from July 7 to 14th , 2017, the classes are by La Fenice theatre, Malibran theatre, Ugo and Olga Levi Onlus Foundation, Music Conservatory Benedetto Marcello.